After a rather harrowing 2009 it was well past time for Mr. the Raclette and me to indulge in some serious comfort. 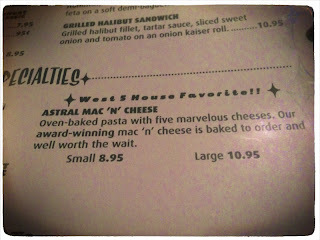 Our beloved Astral Mac 'n' Cheese was calling. Either that or Suzy Gruyere's flattering insistence on a review was haunting my brain. We'd hoped for a front table near the windows (more flattering light for photography), but there was none to be had. Fortune smiled upon us, however, from our booth near the kitchen. Though I normally enjoy looking out I found myself facing the kitchen and, after our order was taken, spying the lad ladling heaping spoonfuls of mac into individual baking dishes. So it's pre-mixed in a giant silver bowl, is it? Interesting...! Our order was taken at 2:47 pm. 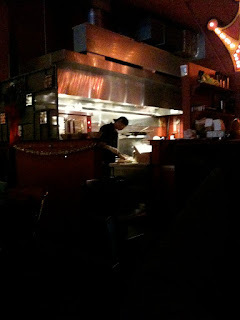 We chatted and enjoyed the ambiance until I saw two blisteringly hot dishes taken from the oven. Yes! Out at 3:02 pm were our entrees. 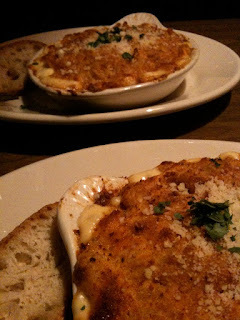 In the past an order seemed to take forever--eager anticipation, no doubt--but in reality it was a mere 15 minutes for the macs to be baked, sprinkled with more cheese and a bit of parsley and delivered. We ordered two small portions rather than one large as I can't be trusted to share. 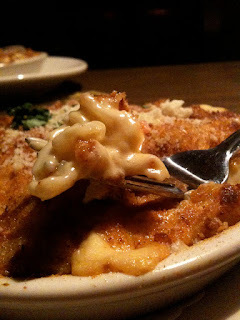 I know from past experience with this mac that thick, delicious cheese sauce envelops radiatore pasta under the crisp topping. Share? Outlook not so good. After being given the usual warning about hot plates I saw that, fresh from the oven, these babies were molten. At the edges the cheese sauce bubbled and popped. Weirdly a childhood image of Yellowstone Park's mud pots leapt to mind. In a less smelly, more tasty way. The first bite burning its way down my throat was so worth it. The pasta was soft, but not mushy. The cheese sauce worked its way into every nook and cranny of the little radiators. I will not accept a dry mac, but there was no danger of that here. The generous coating of breadcrumb topping means that every bite is guaranteed a satisfying crunch. Or for a bit of fun one can tunnel under to get a cheese-only bite while trying to decipher which cheeses make up the "five marvelous." 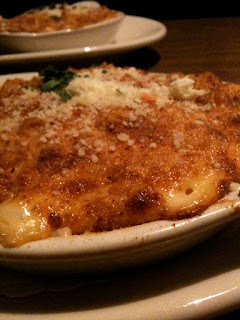 "A West 5 house favorite -- oven-baked pasta with five marvelous cheeses. Indescribably delectable! Like Excalibur, and the great word-of-mouth buzz, quickly becoming a sublime legend for the ages!" Endeavouring to make the sublime experience last, I sucked down the water which brought our server repeatedly to the table. After a while I girded up my loins and asked, "Are you allowed to reveal the five marvelous cheeses??" He was coy, but allowed himself to name 4 of the 5: Cheddar, Reggiano, Jack and...American! I don't deny I was taken aback by the American cheese, but then that could account for the gentle orange hue. I prefer a bit of color to my macs, if I'm honest. Perhaps there was a hint of the processed in the sauce, but I can't find it within myself to complain. Still I was missing one cheese. My Google-fu uncovered two rather different combinations of cheeses: one site claimed Pecorino, Cheddar, Swiss, American, and cream cheese while another listed Cheddar, Swiss, Cotija, Parmesan, and cream cheese. Alas my taste buds are not talented enough to break it down, but again not complaining. Some future kitchen experimentation might be revealing, but undoubtedly I'll just return to the source.